Chris Froome (Team Sky) took a spectacular victory on stage eight of the Tour de France after attacking over the summit of the Col de Peyresourde and holding off his rivals with a daredevil descent towards the finish in Bagnères-de-Luchon. The main GC favourites were all together on the final category on climb of a tough day in the Pyrenees, with no attacks able to stick on the way up, but two-time Tour winner Froome made a move over the summit and launched himself down the descent with just over 15km remaining. At first it looked like the group behind, headed by Movistar pair Alejandro Valverde and Nairo Quintana, would be back on top of him with only around 10 seconds gap put in to them by Froome. But the Brit took every chance on the descent, adopting a super aero position and pedalling furiously, with the group behind unable to make any gains and the gap slipping out to around 22 seconds. After reaching the foot of the descent, Froome looked likely to take the stage win with around 15 seconds in hand, and put in a final effort on the flat run in to secure victory, his sixth stage victory in the Tour. The time bonus on the line also gave him the overall lead for the first time in the race, with Dan Martin (Etixx-Quick Step) taking the second time bonus and Joaquim Rodriguez (Katusha) the third. Adam Yates (Orica-BikeExchange) also finished in the second group, and remains second on GC, 16 seconds behind compatriot Froome. The biggest GC casualty on the eighth day of racing was Alberto Contador (Tinkoff) who lost well over a minute after being unable to follow on the Peyresourde, and now looks to concede team leadership to Roman Kreuziger. Team Sky were charged with doing most of the work on the front through the 184km mountain stages, and seemed happy to allow the trio of Tony Martin (Etixx-Quick Step), Thibaut Pinot (FDJ) and Rafal Majka (Tinkoff) get away on the Col de Tourmalet after an extremely fast opening hour which saw the peloton cover over 50km. They were able to gain around 2-30 up the road, with Majka unable to take maximum KOM points on the summit of the hors categorie climb as Pinot chased a new target after drifting out of GC contention on stage seven. 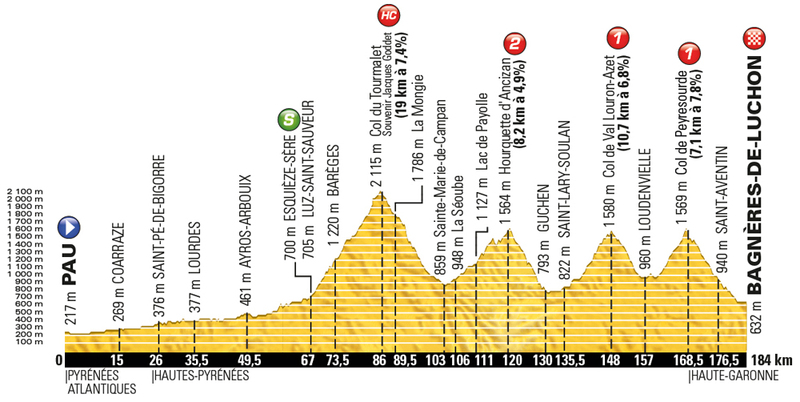 It never looked like it would last though, with the time beginning to tumble as the crested the next category two climb, and eventually they were all brought back on the slopes of the Col de Val Louron-Azet with around 42km to go, with Majka the last to be pulled back. He took third in the KOM points at the summit with Wout Poels and Froome not allowing him to get across the line first. Polish champion Majka still accrued 31 KOM points over the stage, enough to secure polka-dots for stage nine’s mountain test. Race leader Greg Van Avermaet (BMC) suffered as expected in the mountains, and slipped out of contention early on in the stage. But the day really belonged to Chris Froome, who surprised everybody with his attack on the descent, and will now face a test on Sunday to try and defend his narrow lead on the 184.5km stage to Andorra Arcalis.